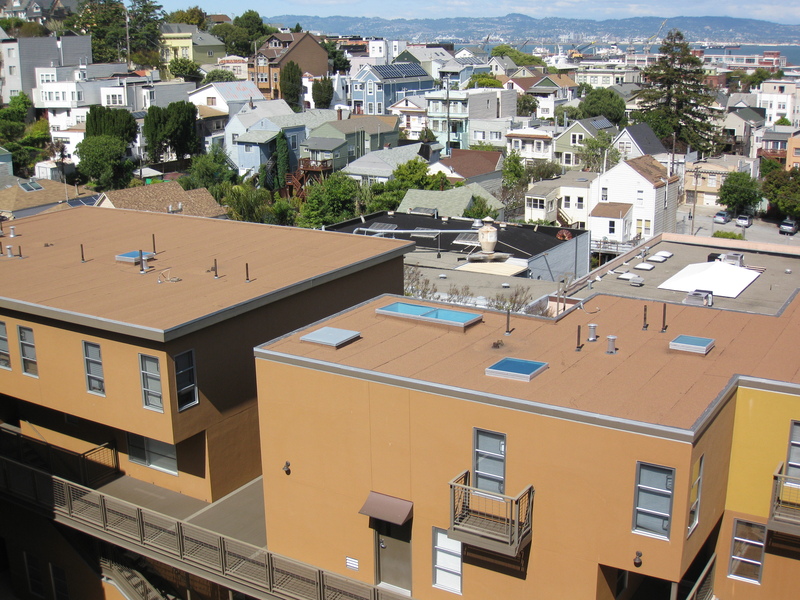 Partial view of the Sierra Heights roofs. The block to the north has four houses with solar panels. As I stood on the roof of our condo complex on a recent sunny day, I could see the roofs of several blocks to the north and east of our three buildings. We live in one of the sunnier areas in San Francisco, so perhaps it shouldn’t have surprised me to see four roofs with solar panels on one block, three on another, and three on the third. But San Francisco is unusual this way; according to the representative from a Fremont-based solar company who stood with me on the roof, more people in San Francisco than in Fremont choose solar, though Fremont is sunnier. Why isn’t solar more widespread? For many, it’s just not affordable; for others, it’s not worth it. A friend living in a small house in Berkeley tells me her total monthly PG&E bill is under $20, so she wouldn’t be able to realize any savings or even break even in the foreseeable future. But for anyone with an electric bill of a certain size (roughly about $75 a month or more), solar is becoming more attractive. 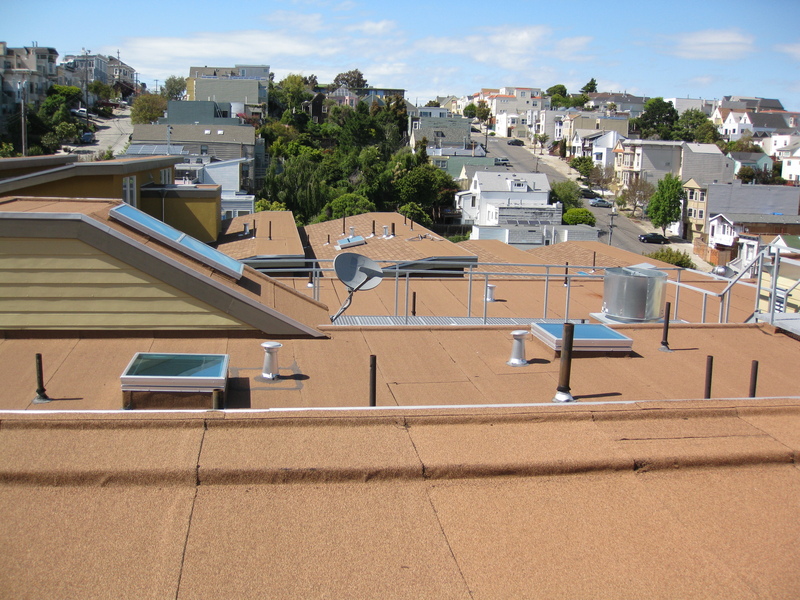 Federal, state, and city incentives can cut installation costs by a third in San Francisco, and most systems pay for themselves and start saving money for their owners long before the 25 years they’re generally guaranteed to last. (Keep in mind that the systems are expected to to outlive that guarantee, and most last quite a bit longer even if they start to lose a bit of efficiency.) You can use this solar power calculator to get a quick general idea of how much you might save. Some time ago I saw a show on TV about a Napa winery that was installing solar to cut costs. Their challenge was keeping the wine barrels cool in the summer, and while they liked the idea of going green, their motivation was cost savings. This was at least a few years ago, before many of the current incentives. It struck me that we need more news about this kind of project. If more people knew that solar could save them money, more individuals and companies would turn to it. View to the east, and more solar panels. So now I’ve started a Green Committee at my condo complex, and I’m researching whether we can get solar panels installed. We have three large buildings with plenty of roof area, though it’s probably not enough for both the individual units and the common electricity. But we spend about $1500 a month on the common electricity, so even if we concentrate on that, depending on the system, we could save an estimated $500 – $1000 a month over 25 years—that’s $150,000 – $450,000 total. Our main challenge will be financing. Since our HOA is a nonprofit, we may not qualify for some tax incentives. If the upfront costs are too high for our 4-year-old complex, which doesn’t have large reserves built up yet, we might be able to get some kind of financing. Another option is to lease the panels; that could allow us to get the system installed, but it wouldn’t give us the advantage of ownership and increased property values. A lease-to-own option would be even more attractive. We’ll need to do further research to see what might be feasible. Another Green Committee member is looking into green financing programs in San Francisco. And I’m in touch with several solar companies who are helping us determine what our options are. Stay tuned for more on this blog! Any updates or progress to report, Rosana? I’m in a condo complex in Mountain View and am interested in investigating options for it. Hi Robert, thanks for checking in. I suppose I should write an update post on this! We’ve had a lot of ups and downs and still don’t have solar. I do feel like we’re getting closer to it every year. Right now our condo is in litigation with the developer, so we’ll likely need to wait till that’s resolved. At the end of 2011, we came close to making a couple deals happen — one was a lease for solar PV, the other financing for solar thermal. In both cases, the companies were unable to secure financing for the projects. However, it seems there might be some possibilities for that now. I suggest contacting Free Hot Water if you’re interested in solar thermal. An option that might work for solar PV is one of several crowdfunding startups — in particular, you might check with RE-volv, which is starting some projects in the area and is funded by donations from the public. Another possibility is Helio Power, which seems to provide more comprehensive plans for condos. In all cases, it’s still challenging getting proposals approved by an HOA — but I’m not giving up! Best of luck to you, too!